Earth can be seen as a living, breathing organism: it regulates temperature, burns energy, continually renews its skin, and experiences changes to its face as it ages with time. Researchers in the the field of astrobiology have found that Earth’s current conditions are temporary and that Earth’s stable climate is an anomaly that will end in the next billion years. Under the oceans, there are the earth’s largest mountain ranges that circle the planet like the stitching on a baseball. More than 80% of the Earth’s surface is volcanic. Holes drilled as deep as 5 miles into the Earth’s reveal that the rock temperature increases about 37 degrees Fahrenheit per 320 feet. Even on the deepest sea floor, rock remains slightly above freezing. A belief of some Native Americans was that the earth is supported by a giant tortoise, which made the earth tremble each time it took a step. Earth was originally born as a twin to the planet Theia, which was about half as wide as Earth and roughly the size of Mars. The two planets shared an orbit for several million years until they collided. Earth absorbed Theia, and the remaining debris eventually coagulated into Earth’s moon. The mass donated by Theia gave Earth the gravity necessary to sustain a substantial atmosphere. The theory of Pangaea states that all of Earth’s current continents were originally a single supercontinent that existed some 200 million years ago during the Paleozoic and Mesozoic eras. The northern part of the supercontinent, North America and Eurasia, was called Laurasia—and Gondwana, the southern part, was made up of Australia, South America, Africa, Antartica, and India. India later broke away and moved north to join Asia. Pangaea was not the beginning position of the land on Earth, but one of as many as six lost worlds that have come and gone. Pangea was preceded by Pannotia about 550-650 million years ago and by Rhodinia around 1.8 billion years ago. Before them, at intervals of roughly 500 million years, Nuna, Kenorland, and Ur existed and then broke up. The Earth’s plates move just a few inches a year—about as fast as a person’s fingernails grow.h This continental pattern predicts that 250 million years from now, a new supercontinent will be born. The beginning of the Industrial Revolution marked the beginning of humanity's affecting Earth’s environment by producing enough carbon dioxide to affect the atmosphere's global balance and chemical composition. If a person extends his or her arm and index finger completely, the beginning of Earth is represented by the end of the nose and the present is the fingertip. Passing a file over the fingernail once would erase all of human history. The metaphor of rock being like Earth’s blood works because Earth’s levels of air and water are kept in balance by rock’s continuous circulation. The amount of carbon dioxide in water and atmosphere and the amount of solar energy the planet receives are two factors that control the destiny of life on Earth and the planet itself. Too much of the greenhouse effect is detrimental to human life—but without some greenhouse effect, Earth’s global temperature would be 0 degrees Fahrenheit (-18 degrees Celsius) rather than 59 degrees F (15 degrees C). Earth’s Amazon rainforest is home to one third of the planet’s land species, illustrating Earth’s ability to sustain itself within a concentrated area. Strong evidence suggests that the universe began with the Big Bang about 13 billion years ago, and two thirds of its history passed before our own solar system was formed. During this time, stars evolved and died, supplementing the basic hydrogen, helium, and trace of lithium that the universe began with and providing more complex atoms such as carbon, oxygen, silicon, magnesium, and nitrogen. The way Earth was formed allows for its many unique traits that have developed and will develop during its life. Earth, which can be viewed as a metal ball coated with rock, hurtles through space at 66,000 miles (107,000 km) per hour. Earth began as sticky dust which clumped, like snowflakes, into a planetesimal, or a body that is about a half mile in diameter. Earth is made up of hydrogen gas, stardust, and gravity. The gas and dust floating in space were drawn together by gravity and they formed into a spinning disc. As this disc collided with and absorbed rock bodies, the Earth formed. Astronomers believe the formation of Earth was relatively quick. Orbiting debris smashed into the newly formed Earth, and gravity and radioactive processes heated its interior to nearly 2000 degrees Fahrenheit. A solid inner core formed as iron and nickel were absorbed into the center. This inner core was surrounded by a molten outer core, and then less dense silicates formed the mantle and crust. The name “Earth” comes from Old English and Old High Germanic words (eorthe and erda, respectively) for “ground” or “soil,” and it is the only name for a planet of the solar system that does not come from Greco-Roman mythology. One half to three quarters of Earth’s mass is made up of matter that would have made separate planets if not for Earth’s cannibalism. 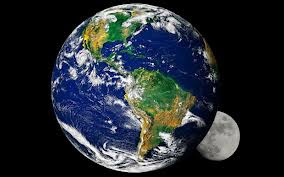 Earth is called a terrestrial planet because it is made almost entirely of rock and metal. Because Earth formed inside the snow line—meaning it was close enough to the sun that water, carbon, and nitrogen were all in a gaseous state—the elements so essential to supporting life had to be supplied in some other way. They were carried to the Earth by dirty snowballs—asteroids that retained water in hydrated minerals. Later those hydrated minerals were heated and the trapped water was released. The Earth had the energy to release trapped water from the energy supplied by the collisions that had delivered the minerals in the first place. The birth of Earth’s moon is singularly important because it stabilizes Earth’s tilt. Without the moon, Earth would still have wild changes in climate and be uninhabitable. The stabilizing tug of the moon tempers Earth, resulting in the minor tip that causes summer and winter seasons. To put the size of each of these bodies in perspective, think of the Earth’s moon as a tennis ball and Earth as the size as a basketball. The sun’s diameter is about 109 times greater than Earth’s, whereas Earth is just about four times larger in diameter than the moon. The great impacts that gave Earth its mass had the potential to blow away the fragile atmosphere that was forming and turn the oceans into steam. Despite these threats, Earth went through a normal birthing process for a habitable planet. Had Earth formed in a more gentle way, the result would have been a cold and dead planet, because the energy of the falling bodies would have been small enough that the bodies would bounce back into space. Because Earth was hit by huge, hurtling chunks of rock and ice, they cratered so deeply into the interior of the planet that their heat, water, and future atmospheric gases were anchored there and retained by gravity. Earth’s ocean of magma was created by bodies crashing into the planet a bit later in its development. Within 10 million years of Earth’s birth, its average interior temperature was hot enough to melt virtually the entire planet, which caused the core to sink to the middle of the planet and left the mantle a bubbling, viscous layer. The great heat of Earth’s core and magma ensured that Earth would have an atmosphere and oceans. It also created plate tectonics, which meant its oceans would be partitioned by dry land. Heat and pressure began creating rock lighter than the ocean floor that would eventually emerge as floating continents. Earth’s unique mix of land and ocean makes the Earth relatively stable by cycling carbon dioxide. Carbon dioxide cycling moderates temperature swings that would otherwise occur. Earth’s greatest source of heat, besides the sun, is its interior, which conducts a hundred billion billion calories of energy to the surface each year—or 1.5 microcalories per .155 square inch of the earth’s surface each second. So much energy radiates from inside the Earth that it could satisfy all human energy needs three times over. As the earth cooled after it had finished growing, the lithosphere—the hard, outermost layer between the mantle and the Earth’s crust—cracked like an eggshell and split into seven large and twelve small floating islands with jagged edges. These islands are the tectonic plates that move continuously over the viscous mantle, rubbing, pushing, and trying to mount one over the other. Although Earth’s plates are made of solid rock, they buckle and twist like slabs of warm clay when they collide. The Earth’s plates were divided into land masses and oceans because of the difference in the thickness and composition of the planet’s two types of crust. Continental crust, mostly composed of relatively lightweight granite, is about 18 to 30 miles thick. The much denser basalt that makes up the oceanic crust is only 5 or 6 miles thick. Because they are more buoyant, the continents “float” higher on the mantle than the ocean floors do. Earthquakes, volcanoes, and mountains are all formed by Earth’s moving plates. Other planets and moons in our solar system have volcanoes, but they do not have mountain ranges like Earth’s because only Earth has plate tectonics. Plate tectonics contributed to making Earth habitable by creating volcanoes as well. The water vapor and other gases emitted by volcanoes during Earth’s early years helped to create Earth’s oceans and atmosphere. When a tectonic plate lingers over a hot spot for a while and then moves on, a volcanic island is formed. A hot spot is a column of basalt that punctures the earth’s crust and allows magma to escape from the interior. The movement of a tectonic plate over a hot spot forms a chain of volcanic islands, called a seamount. One well known example of a seamount is a chain of ancient volcanoes that were once over the hot spot that is now under Hawaii. The Himalayas are examples of the movement of tectonic plates against each other. I really like what you are up too. It was an amazing sort of clever work and exposure! Keep up the amazing works.